UPDATED: Phil Collins to reunite Genesis? 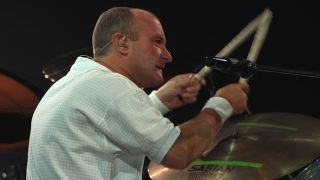 Phil Collins has hinted that he could reunite Genesis. Collins stepped away from the industry in 2011 and it had been widely thought that his days behind the drums were over due to health concerns. But the Guardian reports that he could be about to return to music. Collins told German media: "I have started thinking about doing new stuff. [Maybe playing] some shows again, even with Genesis. Everything is possible. We could tour in Australia and South America. We haven't been there yet." UPDATE: Peter Gabriel has reacted positively to news that Collins could be about to come out of retirement. On hearing that the drummer-turned-frontman could return, Gabriel told Rolling Stone: "Good! I think he got himself into a bit of a hole, and that's great news he's coming out of it. It doesn't have to involve work - but if it does, that's a great indicator. "It's never been ruled out. I'm trying to picture a time when it would top my priorities list though. If you're gonna do it, you gotta do it before you're all dead, right? I was thinking about that the other day. We're quite lucky - looking back at other bands of our generation, there's usually one or two missing now. So you do get a sense of the clock." Whether the return of Genesis means a return to the kit for Phil remains to be seen. Watch this space.